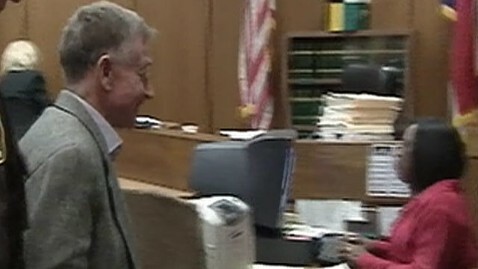 Novelist Michael Peterson was released from prison today nearly a decade after being convicted in the first-degree murder of his wife, Kathleen, in a bizarre case in Durham, N.C., that was dubbed "the staircase murder." Peterson secured $300,000 bond Wednesday. The integrity of the original case was called into question when the testimony of a key prosecution expert was discredited. Superior Court Judge Orlando Hudson ruled that Duane Deaver, a State Bureau of Investigation analyst, misled jurors about the strength of bloodstain evidence in the 68-year-old's 2003 trial, according to ABC News affiliate WTVD in Raleigh, N.C.
After his release this afternoon, Peterson spoke to reporters who had gathered, expressing his gratitude: "I have waited over eight years, 2,988 days as a matter of fact, and I counted for an opportunity to have a retrial. I want to thank Judge Hudson for giving me that opportunity so that I can vindicate myself and prove my innocence in a fair trial this time. I want to thank all the people who've supported me from all over the world. It's impossible for me to express my gratitude. What I want to do now though is to spend some time with, you know, my family and with my children. And certainly at a later time, I'd be happy to talk with everybody and share more. Thank you very, very much." According to a WTVD report, Deaver was fired earlier this year after an independent review found that he either "misreported test results, withheld results that could have helped the defendant or overstated the strength of the evidence to the benefit of prosecutors" in more than 30 cases. In a statement, Deaver's attorney, Philip Isley, said: "We respectfully disagree with Judge Hudson's beliefs about our client, Duane Deaver. Our client did not perjure himself or mislead the jury in the original Peterson trial, in any way." Peterson will get a new trial and must remain under house arrest until then. "Not only are we going to have a second trial in this matter … but [during] the second trial … the state's going to be handicapped, and it all goes back to Duane Deaver being less than honest in his testimony," said David Rudolf, Peterson's attorney. Peterson is a former newspaper columnist and one-time Durham mayoral candidate. He and his wife, a Nortel Networks executive, lived in a sprawling white house in Durham. By most accounts, it was a storybook second marriage for both. But the outward appearances came under serious scrutiny when Peterson called police on the morning of Dec. 9, 2001. In a frantic 911 call, he claimed to have discovered his wife alive but unconscious at the bottom of a staircase. From the beginning, Peterson maintained that his wife had simply slipped on the stairs in a tragic accident after drinking wine and taking valium. However, according to police who arrived on the scene, the amount of blood spilled across the stairs and on the victim immediately raised suspicions of foul play. An autopsy report showed that Kathleen Peterson had multiple lacerations to her skull. According to Jim Hardin, who was district attorney at the time, "It's impossible for me to believe … that could be caused from a series of missteps or a fall down 15 different stairs. I just can't see that happening. This had to occur from multiple inflictions of blunt force trauma." Peterson was arrested and charged with murder. During the 2003 trial, prosecutors said Kathleen Peterson was brutally murdered - hit repeatedly with a fire poker. They also told jurors that Michael Peterson was having an affair with a man, and that Peterson's wife confronted him about it and they fought over his bisexuality. That argument, they say, led to her death. The case sharply divided Peterson's blended family. His late wife's daughter and other loved ones believe he is guilty, while his own children have championed his innocence. "We know he is innocent and we know that the verdict will be different and justice will be served," said Clayton Peterson, his son. But Lori Campell, the victim's sister, feels differently. The fact that Peterson's is getting a new trial "doesn't mean he's not guilty of murdering my sister … I would say he should stay in jail until 12 new jurors find him guilty." Peterson's well-known novels include "The Immortal Dragon" and "A Time of War." ABC News' staffers contributed to this story.